I was supposed to be done in an hour. So I paid the $13.50 and followed the instruction on the vending machine that I do not need to leave the receipt on the dash. 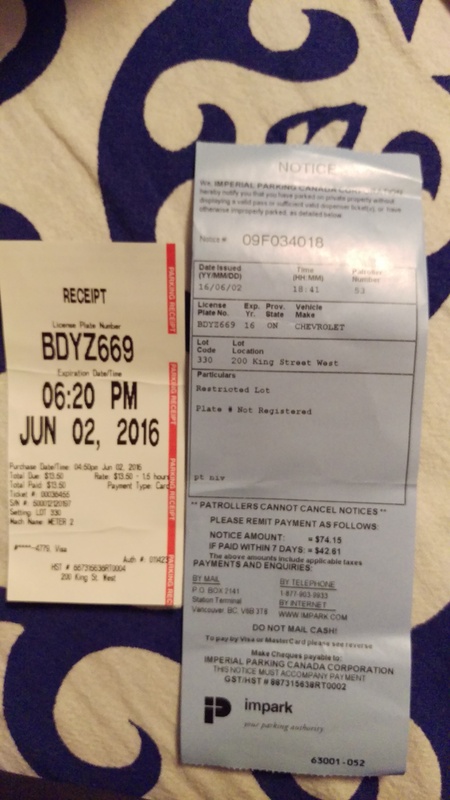 I was delayed by a bit and when I got back to my car (around 7 pm)… I found a ticket of $74.15 … THAT IS… a ticket more than FIVE freaking times than the price of the ticket issued 20 mins after my ticket expired. This is abuse and it must stop! Here is the ticket for your viewing pleasure.